The Pound lost ground on Monday afternoon after comments from Prime Minister Theresa May reinforced expectations that her withdrawal agreement was unlikely to pass in a parliamentary vote this week. uring a House of Commons address, the Prime Minister stated that she currently does not have sufficient support to hold a third vote on her withdrawal agreement. There had been talk over the past few days that May could call another vote on her deal as soon as today. This is, however, now likely to be pushed to Thursday, with the PM scrambling to win over sceptical MPs ahead of the delayed 12th April Article 50 exit date. The next two or three weeks remain critical for the Pound, with the UK’s political future still teetering on a knife edge. We could get more clarity on the next steps forward tomorrow, when the so-called ‘indicatives votes’ take place in parliament. This infrequently used device, which enables MPs to vote against their instructed party line, is hoped could yield a majority in favour of one or more options on how to proceed with Brexit. Should the aforementioned indicative vote show parliament’s desire for a slightly softer Brexit, May’s deal may stand a better chance of passing. That being said, her chances remain slim. The PM is currently around 75 votes short of a majority and, even with the support of the DUP and the two dozen or so hardline ERG members, is highly unlikely to win the meaningful vote, in our view. 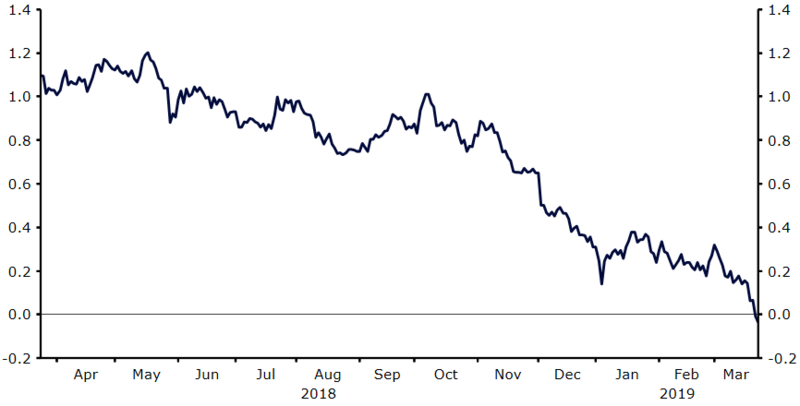 In such an event, we think that a longer extension to Brexit beyond 22nd May is inevitable, the confirmation of which would be supportive of the Pound. The risk to such an outcome would be the increased probability of a general election and possible resignation of May, rumours of the latter of which have been swirling around with increased regularity since the weekend. The US Dollar was broadly weaker against its major peers yesterday, with fears over US growth causing investors to steer clear of the greenback. Monday saw a so-called inversion of the US yield curve - the US 10-year government bond yield fell below its 3-month equivalent for the first time since 2007 (Figure 1). This has somewhat concerned investors, given that an inverted yield curve has historically been followed not long after by a recession. This warning sign, combined with last week’s dovish set of communications from the Federal Reserve and heightened market pricing for interest rate cuts, is likely to keep the Dollar on the back foot this week. There is little macroeconomic news out of the US today, with the next big data release Thursday’s revised Q4 GDP numbers. The Euro held firm above the 1.13 mark against the US Dollar yesterday, helped in part by a broadly more positive set of business confidence data out of Germany. IFO’s business sentiment indexes all beat expectations, with businesses in Germany now more optimistic over the outlook for the Eurozone economy for the first time in eight months. This provides a crumb of comfort for Euro bulls following last week’s dismal PMI figures. Next up for the common currency, aside from news on the Brexit front, will be speeches from ECB members Coeure and Hansson today. Then, on Wednesday, President of the ECB Mario Draghi will be making a public opinion in Frankfurt.